Hello everyone! sadly Paula has decided that after 23 years it's time to hang up her 'jingling shoes'! If you think you could be interested in running Jo Jingles classes in the Wakefield, Pontefract, Leeds and surrounding areas of West Yorkshire please do contact us on 01494 778989 or email: headoffice@jojingles.co.uk for further details. Jo Jingles has been warmly welcomed by many families and children in the area for over 20 years and we would love to see it continue. Jo Jingles is dedicated to leading the very best exciting, fun, educational and interactive music and movement experience for babies, toddlers and pre-school children. Thank you for four years of wonderful Jo Jingles. Isaac has loved every minute of it even if he hasn’t always shown it. Thank you for four years of wonderful Jo Jingles. Isaac has loved every minute of it even if he hasn’t always shown it. You are such a kind and caring person who, I know, Isaac will miss. Thank you for everything over the last 3 and a bit years. All the planning, singing and dancing has been worth it. Edward and I cannot thank you enough for a fabulous time at Jo Jingles. Thank you very much for all of the wonderful Jo Jingles classes. Jai and I have enjoyed every minute of them and they have given him many skills he will use for the rest of his life. We have enjoyed coming to Jo Jingles since Minnie was just a few months old. You have been integral in building her confidence and, of course, her musicality. We will miss you! I want to say ‘thank you’ for the lovely Thursday Jo Jingles classes. Finley was 3 months old when we started and Jo Jingles was the first class I took him to. You helped me become more confident as a parent and made me feel very welcome. I was very nervous at first as I didn’t know anyone but the classes helped me meet the friends I have today and for that I am grateful. Finley has loved his classes and we will continue to recommend Jo Jingles to the people we meet. Thanks again for a brilliant experience. I wanted to write to you personally to thank you for taking the Jo Jingles class that both my children attended. I wanted to write to you personally to thank you for taking the Jo Jingles class that both my children attended. It was the best decision I made when I booked my first child, Max, in. I was used to working 24/7 and all my friends worked so when I had Max, I had to find a new life for myself - and what a life! - 45 min Jo Jingles class and then coffee mornings, coffee mornings, coffee mornings!! I met so many lovely people that I still stay in regular contact with now and when I started taking my second child, Olivia, I met another fantastic group of mums. The kids loved the classes and looked forward to going and in all the time that I went, you never once let us down and had to cancel. You gave everyone equal attention and goodness knows how you remembered everyone's name! The classes were very well structured and considering the young ages of the children, very calm! I would recommend Jo Jingles to anyone and will miss my Tuesday morning singalongs. Our Mummy started taking us to Jo Jingles just after we were 1. We are now 3 and have to stop going because we have to go to pre-school and we are very sad about this as we loved it! We learnt lots of songs, did lots of actions and even got to play lots of musical instruments. Paula (our teacher) was really really good and she made sure at all time that we participated - and kept smiling, encouraging and laughing for the whole session!! We made lots of new friends (and Mummy did too) and it really boosted our ability to take direction, listen and respond to the music and learn rhyming actions. Paula made all the sessions fun. They were carefully planned and had lots of variety in them - from dancing under bubbles, to making balls bounce on a parachute and having themes such as transport or animals. We particularly loved dressing up for Children in Need as 'Boogie Bugs'! Our Mummy loved the fact too that as we are twins (and sometimes difficult to handle) she felt confident that at the Jo Jingles classes, she could manage with us on her own and know she was in a supportive environment should there be any one to one activities - Paula was always happy to step in and dance with one of us. Our Mummy says we would recommend Jo Jingles to anyone who is thinking of doing something exciting, safe and fun with their children. Not only did it give us confidence and a wonderful introduction to the world of music and rhythm, Mummy has memories of us here that will liever with her forever! ..... not to mention the songs that go round in her head!!!! My son attended Jo Jingles from the age of 9 months up to 3 years. My daughter was present at classes with my son from birth and started to go by herself from the age of 1 year. Both of my children have thoroughly enjoyed the experience. They love learning how to use the instruments and join in with all the actions and dancing. They especially enjoy using all the props that are used to reinforce learning such as the parachute and cuddly toys. My son was very shy when he was younger. Attending Jo Jingles helped him to build on his confidence in being in a group situation and learning to interact with his peers. The presenter who runs the sessions we attend is a fantastic lady who is brilliant with the children and parents alike. Rhys has enjoyed all aspects of the Jo Jingles session. His confidence has increased massively and he joins in more of the activities than when he first started. His musical skills have really developed and this is mainly due to him listening more closely to the music and begin able to co-ordinate his body in time with the music. He loves looking in Jo's bag and it has made me more aware of what he knows and what he understands. The fact that the children get different instruments every week is something he looks forward to. In preparation for school his skills of listening to others and speaking in front of others has really developed. it's a nice way to spend time with him focusing on something he likes doing. Thank you! I just wanted to say how impressed I am with the Jo Jingles class at Boston Spa. I just wanted to say how impressed I am with the Jo Jingles class at Boston Spa. I have been taking my 2 year old grandson and it is proving to be a lovely experience. Charlotte who leads the class is excellent. The welcome is warm and the class is well organised and happy and makes children and carers feel secure and relaxed. The pace is just right and the children's enthusiasm and interest maintained at all times. The balance between lively activity and gentle relaxation is spot on. I particularly like the fact that familiar favourites and rituals are interwoven with new and fresh experiences. My grandson loves the bubbles and the sleeping bunnies song. Thank you for such a wonderful, local resource and such a good teacher. We have been attending Jo Jingles classes for about 2.5 years. My son loves it! It is the highlight of our week and Paula and the team are like family. They put so much work into making the classes educational, entertaining and magical for parents and kids. Worth every penny! My 3 year old has been enjoying his weekly Jo Jingles sessions since he was 6 months old. My 3 year old has been enjoying his weekly Jo Jingles sessions since he was 6 months old. It's a fun, friendly environment that encourages learning through play and is excellent value for money - highly recommended. My daughter has been going to Paula at Jo Jingles since she was a few months old. She is now 4. Lily absolutely loves it. My daughter has been going to Paula at Jo Jingles since she was a few months old. She is now 4. Lily absolutely loves it. Her confidence has grown and she has developed a range of musical skills. My favourite thing about Jo Jingles is watching the children enjoy themselves tap a beat in time to the music with such concentration. I would like to thank Paula for all her hard work and giving my daughter an excellent start to her music journey. I can't praise Jo Jingles enough for the way it has encouraged James to enjoy music since he started his first class at 8 months old. I can't praise Jo Jingles enough for the way it has encouraged James to enjoy music since he started his first class at 8 months old. Now, at 4, he is familiar with percussion instruments and rhythm, loves singing and playing, and has performed in 2 concerts! Though fun and often loud, Jo Jingles classes are full of musical knowledge, setting the children on the path to discovering their own musical interests. My children have attended Jo Jingles since they were tiny babies and I will be sad to see them leave to start school full time! My children have attended Jo Jingles since they were tiny babies and I will be sad to see them leave to start school full time! the classes are fun and interactive which has made every session enjoyable for them. They have learnt vital skills like listening and taking turns as well as musical skills and showing off their dance moves. 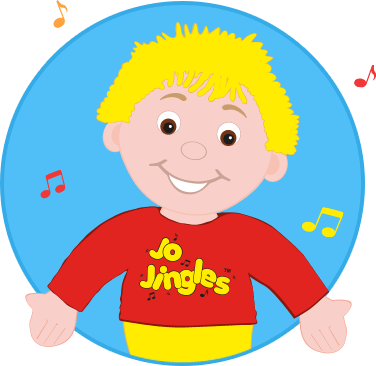 Jo Jingles has helped my children develop confidence and a real love of all things musical. The staff are fantastic and I would recommend these classes to other parents looking for a fun, educational class for their little ones. We started our Jingles classes at 12 weeks old, and continued until my daughter was nearly 4 years old. We started our Jingles classes at 12 weeks old, and continued until my daughter was nearly 4 years old. We have so many special memories from classes, and I have seen her grow hugely in confidence. She never stops singing, and is always getting her own "instruments" out of my kitchen cupboard to play along to the Jo Jingles CDs! Jingles has helped teach her about colours, counting, rhythm, days of the week, and given us so much laughter and fun. The class leaders genuinely care and are interested in what she says and does in classes. There is a huge variety of instruments, activities and themes, which are age appropriate, although the parachute and bubbles have remained firm favourites with my daughter from Babies through to Jo Jinglers. Being a working Mum, the time I do get with my daughter is really precious, and the Jo Jingles classes have always been special time well spent, which we have both enjoyed enormously. Jo Jingles has been visiting Safe 'n' Sound Day Nursery for over 10 years, providing three age appropriate music and movement sessions for our babies, two year olds and three to four year olds, which the children eagerly anticipate. It is Fun! Fun! Fun! to sing, play instruments and dance. The children experience a wide range of musical activities which are linked to all areas of the Early Years Foundation Stage, such as counting and the development of fine and gross motor skills. The children develop listening skill and learn about different beats and rhythms which also supports the learning of phonics. More importantly, the children are developing personal and social skills - waiting patiently and turn taking. all the children are able to take part and enjoy a sense of achievement, building on their feelings of confidence and self-esteem. 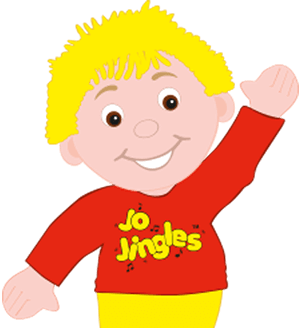 Jo Jingles promotes children's confidence, listening skills and turn taking. 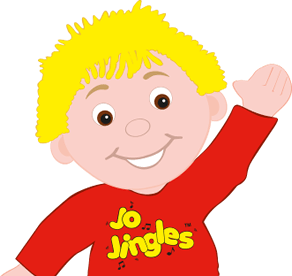 Jo Jingles promotes children's confidence, listening skills and turn taking. It supports our letters and sounds programme and helps the children learn many musical skills - names of instruments and how to play them (loud, soft, fast, slow).